The Mexico, intended eventually as a replacement for the 5000GT, arose following the development of a customer car by Italian design studio Vignale which was built as a 2+2 with a 4.9 litre V8 and appeared at Turin in 1965. 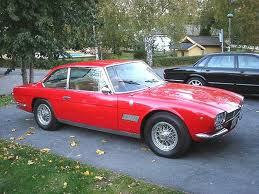 The following year the definitive version of the car was presented at the 1966 Paris show with a 4.7 litre V8. Somewhat uniquely, the car was offered with the 4.2 litre motor from 1969. It has a brief appearance in Classic in the Barn.